German through and through, Candy Guru super fan Susie delivers again with a sweet we hadn’t yet tried – and should have. The Ahoj-Brause company is old school German. 1925 old school. They went to market first with an effervescent powder, which they appear to call ‘shower’ powder. They still sell it. You put it in your water to make a fizzy ade. Sounds delightful. Then in 2002 it appears our friends at Katjes took over and started making candy with the recipe. And here we have the soft Brause-ringe, which I’m pretty sure means “Shower rings”. So per the above, it’s not like you bathe in these things. 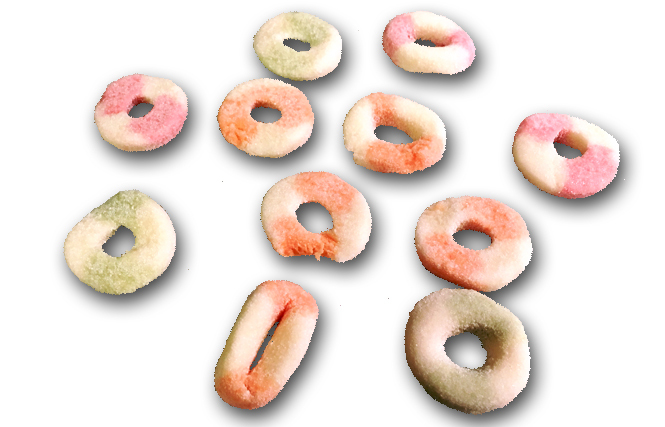 Rather, they are the ‘ring’ incarnation of the shower powder. We all on the same page? ok good. Now that we have the history, let’s dig in. The ring shape fooled me. I expected a tried and true chewy gummy, like most rings we see in the States. But these are more foam than gummy. Not foam like the back of a gummy frog – actually light and airy. Ok this will sound weird but I think the texture might be like shaving cream that was left out in the sun for 3 days: congealed, solidified, and cake-y. The rings start out firm then disintegrate rather quickly. It’s a unique texture that’s fun to eat. The rings are also truly tangy. Sour too, yes – a good strong sour, and tingly like I assume their shower powder drinks. Nice touch. The flavors are orange (they almost fizz like soda pop), raspberry (very fruity and maybe more sour than the orange but not as tangy) and Waldmeister – which is a plant of some kind the Germans use to flavor everything from beer to sausages. It tastes herbal, not full-on licorice, but earthy and a hint of anise. Whatever it is, it’s good. 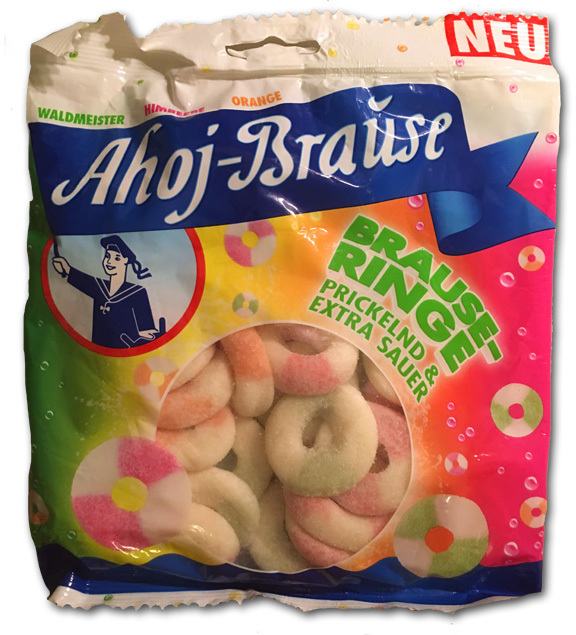 These Ahoj-Brause rings are the real things. It’s rare when I dive into a candy that I assume I won’t like, take a few bites, become intrigued, and then start liking way more as I eat more. That’s what these things do. The sour is great, the tang is like how Brits might describe ‘sherbet’, and the flavors are very different from each other and unique. The only drawback is that these might be too soft for some of you. The foaminess means they melt in your mouth faster than your average gummy and for those of us who like chews, we may wish we got more to gnaw on. I’m going to put them in the fridge and see how they turn out in a few weeks. But I like where these are heading; I’m sure sie werden fantastisch sein. Haha, “brause” has two meanings: shower, but also lemonade.